Opening in the 1950s in the quiet university town of Lund, Sweden, A Fortune Foretold follows Neta, a shy and intuitive girl who turns to books whenever life gets difficult. When her Aunt Ricky has her fortune told, Neta becomes fascinated with prophesies, fate and what life could be. By thinking of this she starts to make sense of the chaos of her parents failing marriage. A Fortune Foretold is a story of childhood, and not a particularly happy one. I didn’t realise straightaway but Neta is a stand in for the author Agneta Pleijel and the book is based on her childhood. Throughout the book there’s times when the narrative voice is like the adult Neta, looking back on events with hindsight and giving her thoughts on what happened now. The language used throughout the book is melancholy, and the words are often more grown up than Neta is at the time. This fits in with the way it feels like an adult is telling the story of her childhood and has a mature way to express what she at ten years old might be feeling. With the use of more complicated language and Neta’s quietness, it feels like she’s constantly out of sync with the rest of her family. Her parents are both outgoing people and as the oldest of three girls, Neta is sometimes too old for them but not old enough to be around adults. Neither of Neta’s parents seem to particularly like or want their children. They both are selfish in different ways but as it’s largely told from a child’s point of view, it never really passes judgement on it. Instead, that’s just what Neta’s life and parents are like. A Fortune Foretold is quite sad as it shows how an emotionally neglectful upbringing can have ramifications for a child as they grow up. From a very young age Neta shuts herself off from the world and becomes quite distant towards others and seeing how a parent’s marriage can fall a part due to secrets and lies has a lasting affect in her. There are some moving scenes in A Fortune Foretold about growing up and family, but it’s quite a slow story and at times the characters do feel flat and is they are just going through the motions. This may because of the way it was told, like someone recounting past events to a listener, so everything had already happened and so there was no suspense or surprises. 3/5. This TBR post is basically going to be one big month-long TBR but a subset of these books will be relevant to my Indieathon TBR. March is Women’s History Month and because I became aware of this sooner rather than later, I plan to focus on reading books by women this month. Each year I read a pretty equal split between male and female authors, but I always find it interesting to take a proper look as to what’s on my shelves. Also in March is the Indieathon, which is a week-long readathon where the aim is to read books from independent publishers. This readathon is hosted by Ninja Book Box and it runs from Friday 8th to Friday 15th March. In this big TBR post there will be far more books than I could possibly read during a month (though saying that I am going to making some long train journeys for work this month so that’ll give me more reading time than normal) and I’ll note which books are from independent publishers so those are the ones I might read during the Indieathon. I have many unread books that are written by women but not so many unread books that are from independent publishers but, surprisingly to me, most of the books on this TBR are indie books. Burning Cities by Kai Aareleid (translated by Adam Cullen), published by Peter Owen Publishers. Mere Chances by Veronika Simoniti (translated by Nada Grošelj), published by Dalkey Archive Press. 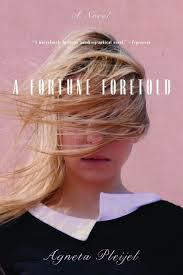 A Fortune Foretold by Agneta Pleijel (translated by Marlaine Delargy), published by Other Press. Soviet Milk by Nora Ikstena (translated by Margita Gailitis), published by Peirene Press. The first four indie books on my TBR this month are all for my Read the World Project. I have, at my last count, 149 countries left to read so it’d be nice if this month could give me a push with my international reading. Set in the Estonian city of Tartu, Burning Cities follows two generations of the Unger family from the Second World War to the twenty-first century. Mere Chances is a collection of short stories that are said to be strange and about characters who are struggling to maintain their identities. Soviet Milk is about the affects of Soviet rule on one person, how a woman strives to become a doctor but outside forces stop her and even deprive her of her relationship with her daughter. A Fortune Foretold is a coming of age story about a young girl in 1950s Sweden who uses fortune-telling and prophesies to make sense of the world around her. The last indie book on my TBR is one I received from Ninja Book Box’s Summer Reading box last year; The Red Beach Hut is about the friendship between an eight-year-old boy and a man who takes refuge in a red beach hut. I’m not sure which indie books are the ones I’ll read during the Indieathon specifically, as I’ve said before I’m very much a mood reader, but these books are both from independent publishers and by women, so I hope to read them this month. 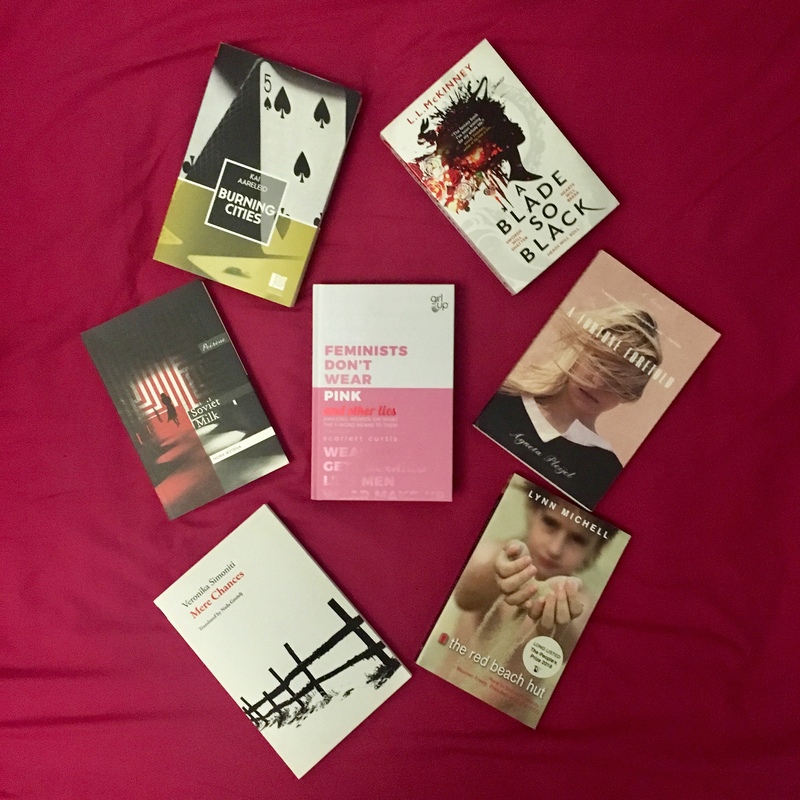 All the books mentioned so far feel like they are serious reads so I’ve also picked up Feminists Don’t Wear Pink and other lies it’s a collection of essays and writings from lots of different women from different walks of life, so it’s something I can deep in and out of easily. The last book on my ridiculously ambitious TBR is A Blade So Black. I thought it’d be a good idea to throw some YA in here and this is an urban fantasy story inspired by Alice in Wonderland and with a black protagonist. These are all the books I’d like to read this month. Are you focussing on reading books by female authors this month? Or are you taking part in the Indieathon? There’s going to be Twitter chats and Instagram challenges so I hope they help me to keep on track. Whish me luck! If I read five of these books that’ll be good for me. Tis The Seasonathon is a week-long holiday themed readathon that takes place from midnight on Monday 3 December to 11:59pm on Sunday 9 November, whatever your time zone. The hosts of this readathon are Bookables, A Court of Crowns and Quills, Super Space Chick, Between Chapters and Chelseadolling Reads. I’m using this readathon to get me back in the reading zone. Last month I read three books, which isn’t as many as I’ve usually read a month, so I want to get more reading done over the next week and finish my 2018 reading on a high. To be honest my TBR is isn’t that festive but I have chosen some books that go with some of the optional challenges below. 1. Read a book with red or green on the cover. 2. Read a book while listening to holiday music. Extra/Bonus Challenge: Read the Buddy Read, Snow in Love. Uprooted is going to be my main focus of this readathon. It’s been in my possession for years now, plus I need to read a book with a title beginning with the letter U to complete the A-Z Reading Challenge. 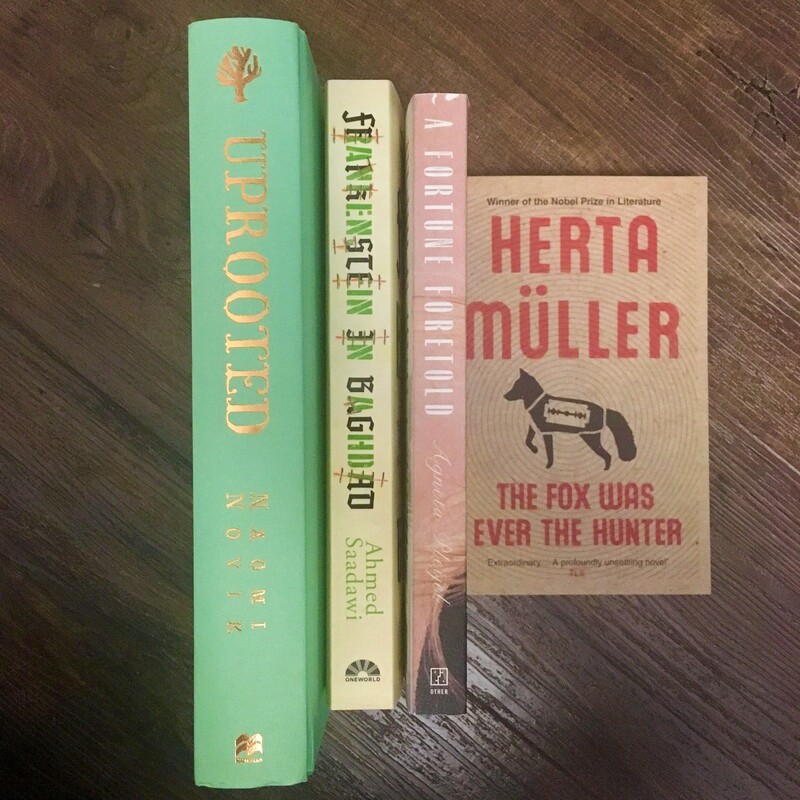 Uprooted, Frankenstein in Baghdad and The Fox was Ever the Hunter all complete the first challenge as they have either red or green on the cover (I don’t have the dust jacket of Uprooted to hand at the minut). A Fortune Foretold and The Fox was Ever the Hunter are both under 250 pages long so they class as a short book. Not sure which book I’ll read while listening to festive music but I’m sure I can cross off that challenge too. So that’s my TBR for the Tis The Seasonathon! Wish me luck! We all know that readathon’s can be hit or miss for me, but I do really want to read these books so hopefully that’ll help. There’s a Twitter and an Instagram for the readathon and you can use the hashtag #tistheseasonathon to follow all the action. Are you taking part in the Tis The Seasonathon? Or any other end-of-the-year readathons? I think it can sometimes feel like a mad rush at the end of the year so we can hit our reading goals but I hope everyone’s still having fun with their reading and remember – goals aren’t that big a deal. Just going to take this moment to give you all a heads up – I’m planning to challenge myself with blogmas this month! So that’ll be a blog post a day on the run up to Christmas, there’s going to be the usual film and book reviews but there’s going to be a whole host of other stuff too. I think I have ideas for all 25 days, but if you want to suggest anything to me, feel free!